Corporate cartoon humor featuring executives is available for any professional or commercial usage here at DansCartoons. I’m offering a lot of my best business cartoons for use in any professional or commercial projects being planned. Some of my favorite cartoons I’ve created are those from my business cartoons catalog where I’ve created women executives in many of my panels, black cartoon characters in corporate settings and many more. To follow are some links to cartoons that depict executives in corporate scenarios and office settings and by clicking each descriptive link, you can go to the actual page of that cartoon where you’ll be able to review licensing options for various uses and then pay for your chosen usage. Take your time to browse and contact me me should you have any questions about any of the cartoons listed here. 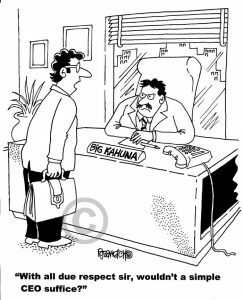 Any of the corporate cartoon humor presented here is also available for quick editing where the cartoon could be re-drawn to your specifications and even colorized of you wish. The cartoon gag line underneath is also open to editing to something else that may speak directly to your audience or readers or attendees.